Rinya is the story of a young boy between childhood and the beginnings of adulthood at a time that would unravel his culture which had persisted virtually unchanged for thousands of years. 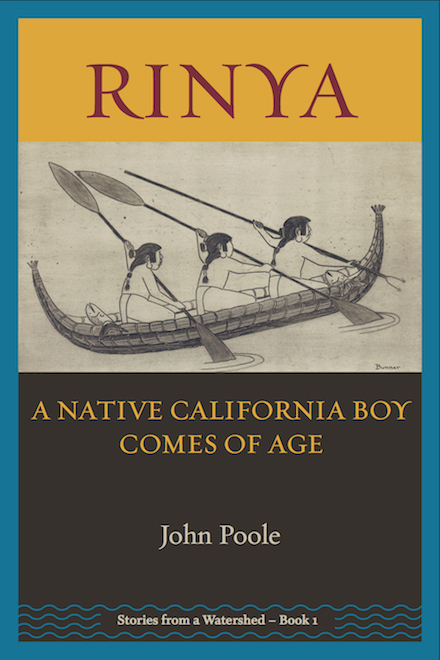 Rinya goes with the men of his tribe for a fish harvest, watches his father prepare to hunt deer, is invited to join the men for a sweat lodge when he has heard the call from his protective animal spirit. The life of the village enfolds him in its routines, fresh every day, until traders arrive with news of the arrival of the Fathers of the Children of the Mule who bring new and exciting trade goods, word of new gods…and disease. Rinya, a work of historical fiction for young people: a tale of the swift unraveling of an aboriginal culture in the face of a conquering and colonial people looking to supplant enduring languages and cultures in the name of their way of life. Rinya is the first of a series of children’s books from original people writing from specific watersheds. We will be introducing our illustrators and artists as well as the team of professionals engaged in designing and promoting Rinya. We will have the privilege of being the first to publish the prints of Bunner McFarland, who lived with California native people in the 1920s–1940s throughout the Bay Area and California. These works are the only surviving output of McFarland’s pioneering anthropological work as an artist. We welcome any manuscripts that tell the story of an original people from a specific watershed for our children’s book series. To pre-order the book, or to arrange for a book talk, write to us at info@sitiotiempopress.com. For more information on this book or the series, go to sitio tiempo press.